I am thrilled to announce that starting today, I will be doing a monthly series that centers around motherhood! This series has been a long-time coming. 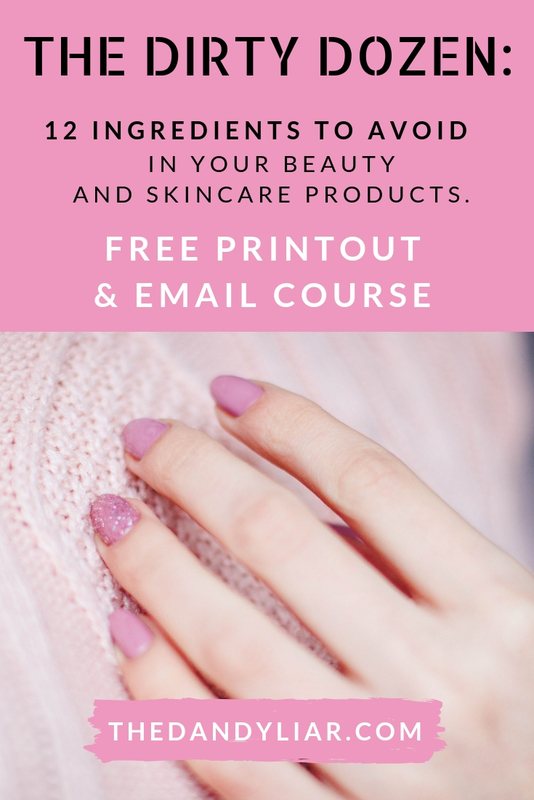 I’ve been a mother for three years, and have largely stayed away from the topic on both my blog and social media (other than my bump updates). And I must admit, it has been strange to not have such a huge part of my life be topic of conversation on The Dandy Liar. Well, all of that is changing now! Each month, you can look forward to a new post on motherhood. Myself, along with Maggie from Polished Closets, Marquis from Simply Clarke, Caroline from Caroline Hulse, and two other guest bloggers, will cover a topic of motherhood in a series that we’re calling ‘Mom Talk Tuesday’. Polished Closets: Maggie lives in Charlotte, NC with her husband, son, and two cats. Her son, Lincoln, is turning 2 (today!). Maggie’s blog focuses on affordable and relatable fashion, motherhood tips, and inexpensive home decor. Her first Mom Talk Tuesday post is all about her first two years of motherhood. Simply Clarke: Marquis Clarke is a wife and modern mom of two (2 year old Kevin Jr. and 4 year old Brooke) who lives in Houston, Texas. 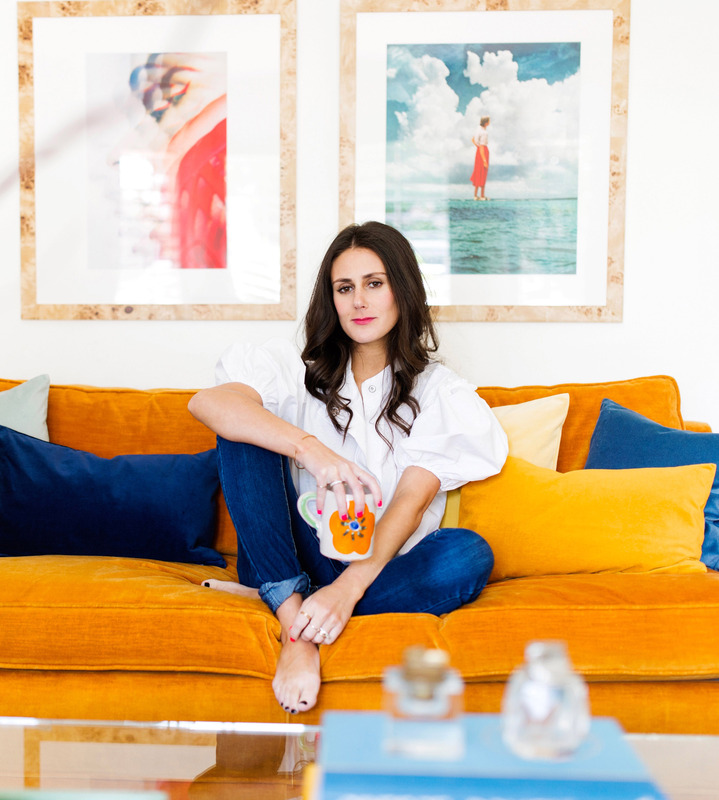 She strives to to encourage women throughout marriage and motherhood, and to embrace life- from toddler meltdowns and family dance parties to goldfish galore! Caroline Hulse: Caroline lives with her husband and two littles, Tinsley and Harrison, in Fort Worth, TX. She loves spending time as a family outdoors, brunching at her favorite local cafe, mixing and matching outfits, and redecorating her house. She lives for for Fridays at Chick-Fil-A and never misses a morning cup of coffee. Be sure to check out each of their posts! 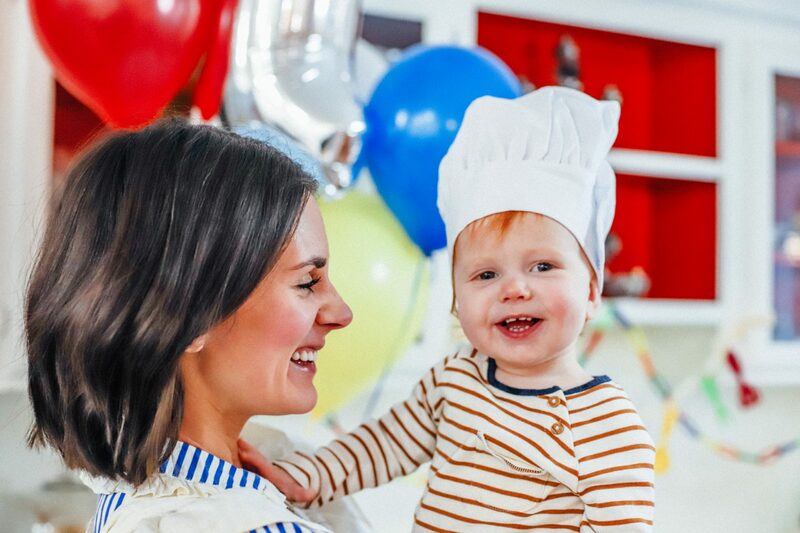 Today, for my first Mom Talk Tuesday post, I’ll be sharing all about my son’s budget-friendly baker themed 1st birthday party! It all started with a nickname. My son, Patrick, just turned one years old. Since the time he was born, Adam and I have called him ‘Patty’. Patty soon turned into ‘Patty cake’, which then quickly became ‘Patty cake, baker’s man’ (long nickname, huh?) after the nursery rhyme. 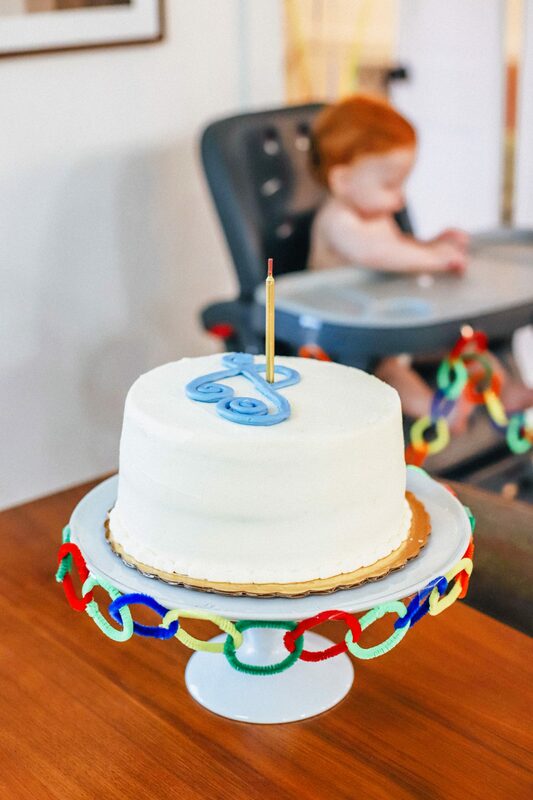 So when it came time to celebrate his first birthday, I had the perfect inspiration: a baker themed 1st birthday party! Pat-a-cake, pat-a-cake, baker’s man. Bake me a cake as fast as you can. Pat it, and roll it, and mark it with “B”, and put it in the oven for baby and me! So, other than having loving friends and family over to celebrate, these were my must-haves (in order of importance): budget-friendly decorations, a really tasty cake, making sure that the decorations were on-theme, and that all of the above was not too time-intensive. Adam and I both work full time, so one thing I did not have in planning this was the luxury of time. 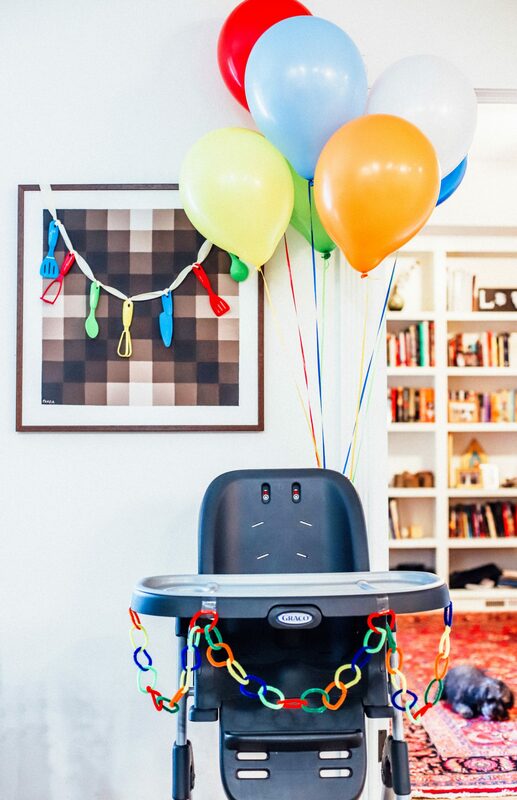 Things I could care a less about: the invitation (we sent out an email), expensive decorations (the kid is turning one, and isn’t going to know the difference), party favors (there were four kids in attendance, and one of them was Patrick, and did I mention budget?!? ), and food (the party took place between 2-4pm, so there wasn’t a need for many snacks). Since it was a baker’s themed party, I knew there were a few must-haves. I needed baking utensil decorations, a chef’s hat and apron for Patrick, and an amazing cake. But since staying under-budget was a major priority, I went straight to a local Dollar Tree to look for decorations. I wasn’t sure what they would have, but I knew I would likely find some cheap kitchen supplies that I could use as decorations. To my surprise, not only did they have baking utensils, but they had a pre-packaged set of kid’s kitchen utensils, all in bright primary colors! 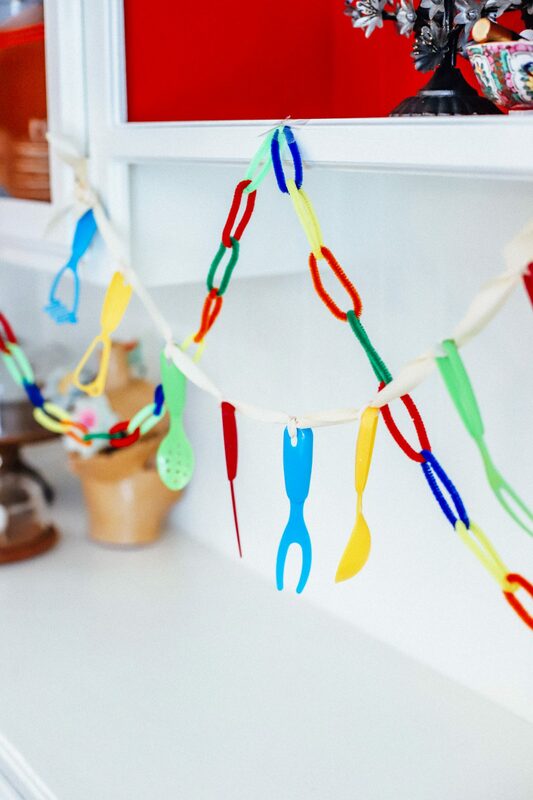 They were smaller in size than your average utensils, so I knew they would be perfect to tie on a string and make a bunting out of. I also knew that Patrick and Johanna could play with them once they party was over, so they wouldn’t go to waste. While I was at Dollar Tree, I picked up a couple packages of primary-colored pipe cleaners to make garlands out of! They were super easy to make (no glue required! ), and cost me less than $3 in total. 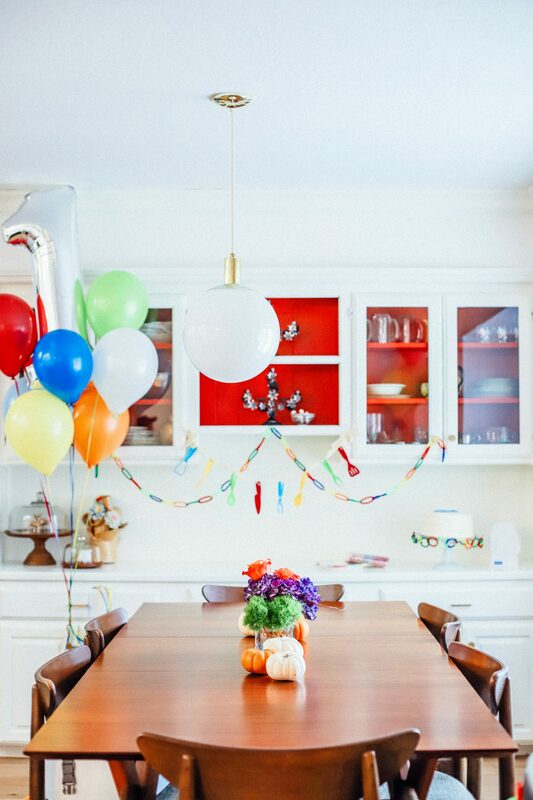 I was able to use them to decorate the cake stand, Patrick’s high chair, and the buffet! After I found the kid’s utensils and pipe cleaners, I decided to browse the party section of Dollar Tree. That’s when I came across these balloon-motif paper plates and napkins in the same primary color scheme as the utensils. They were $1 each, and perfect! You can buy the same set from Amazon, but it’s a little bit pricier. When it came to balloons, it was actually cheaper to go purchase them from Party City. I bought basic latex balloons in primary colors, and a mylar “1” balloon. Something I did that created an impactful visual effect was to put clusters of balloons together. I then divided the clusters between between Patrick’s high chair and the buffet. 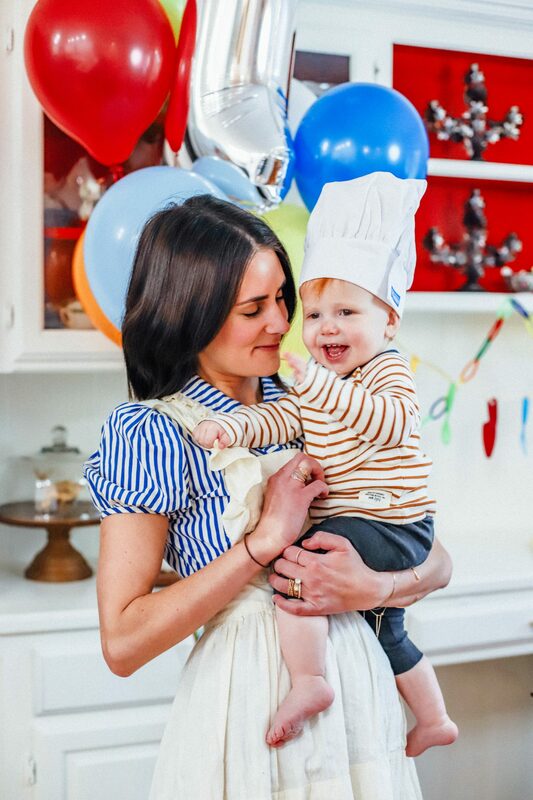 I mean, what is a baker themed 1st birthday party without a baker’s hat and apron!? Answer: it’s not one! One place I knew that was sure to have a baby sized chef’s hat, along with anything else my heart might desire- Amazon! And again, in the spirit of zero-waste, I knew we would re-use the set after the party when the kids play dress-up! Ahh, maybe my favorite part of any party: the cake! The cake that I ordered for Patrick’s birthday holds a special place in my heart because it’s the same cake that Adam and I had at our wedding! It’s the Berry Chantilly cake from Whole Foods, and as a tradition, I order it for every birthday party we have! The reason for this is two fold: 1) I have never tasted a more delicious cake in all my life. Does vanilla cake filled with fresh berries and topped with a creamy almond and mascarpone chantilly frosting sound as good to you as it does me?! Not only does it taste like a slice of heaven, but its made with only the best ingredients. 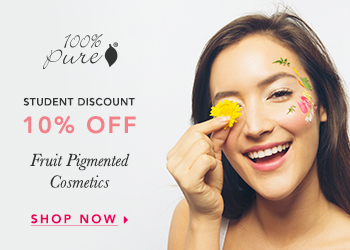 No artificial flavors, dyes, or pre-packaged fruit is used- only the freshest ingredients! 2) The cost savings is really incredible when you compare the cost of the Berry Chantilly cake to your typical wedding, or even birthday, cake made with quality ingredients. The Berry Chantilly comes in two different sizes: a 5″ round costs around $9, and is the perfect size for the ever-popular “smash” cake. It feeds around 2 people. The 8″ round, which is the size I order for birthday parties, costs $34, and feeds 10 people. 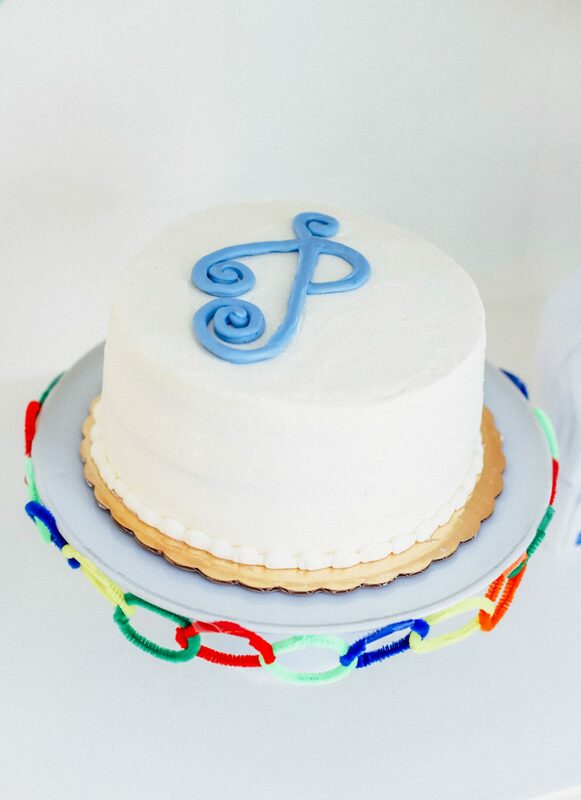 Both sizes come with free customized decorations, although I usually ask the cake decorators to leave the top plain or, as with Patrick’s cake, topped with a simple letter. Compare all of this to the average cost of an 8″ birthday cake, which costs around $96. 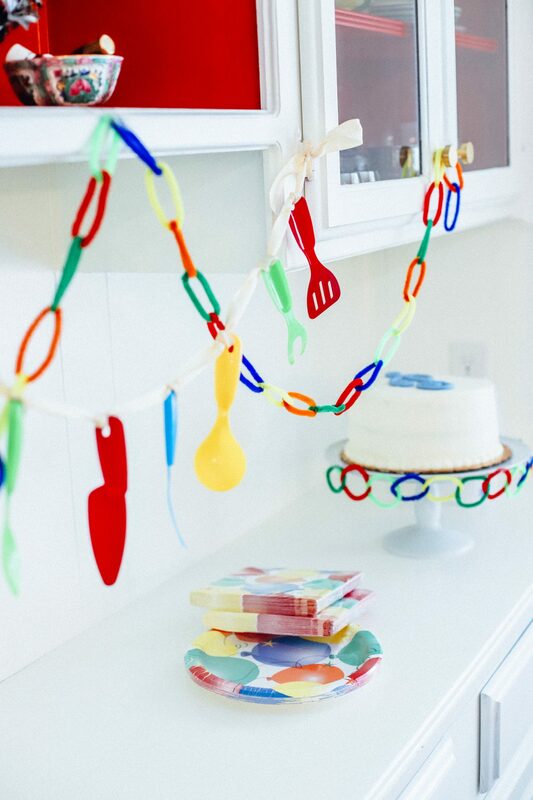 And there you have it- the perfect, budget-friendly baker themed 1st birthday party! 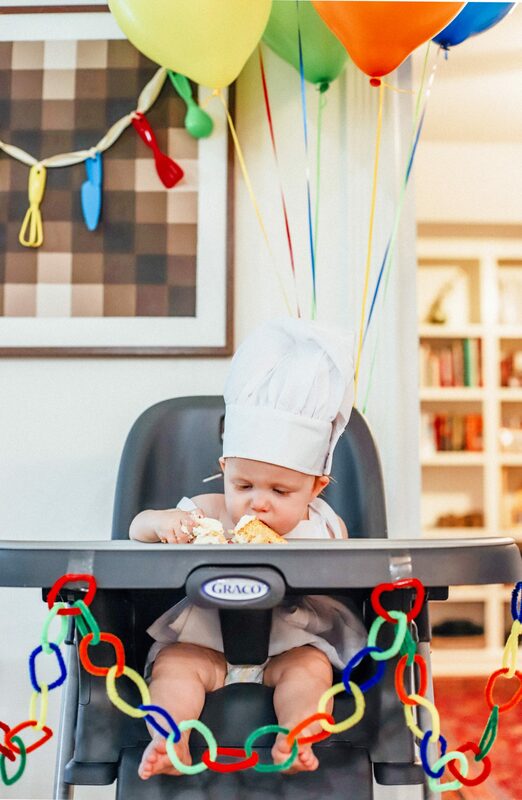 So I want to hear from you- how did you celebrate your child’s first birthday! ?